Read a sampling of how Animal Connection has helped people with their dogs, cats, horses and even vultures! New success stories are included in our monthly newsletter. Subscribe here. To look at Bay Lee and Magic in their stalls today, they look like many other horses who are well cared for and loved. Unfortunately, this was not always the life they lived. Mary M. contacted me in October 1997. Mary explained that both horses had been abused and had many emotional problems. Aside from wanting to reassure them that they were loved and find out what their thoughts were about their lives, Mary had a more immediate problem. She was moving from Washington to California and the horses were slated to move too BUT….due to past abuse, they would not walk into a trailer. Although Mary's trainer had worked with them for months, no progress was being made. As is the case many times, I was called as a last resort when traditional methods fail. I began my work with Bay Lee and Magic by gaining their trust... not an easy thing to do with two horses who had learned not to trust people. It took some time, especially in Bay Lee's case, but by the end of the first session, we were making progress. Over the next few months, I communicated with Bay Lee and Magic and described their journey to California in detail. I continued to build their self-esteem and reassure them that the human family they now had loved them very much and would keep them safe. They were not happy about the trip but they loved Mary and wanted to remain with her. With continued reassurance that they would be safe and see Mary again at the end of the journey, the big day was approaching. There is a happy ending to their story. The day of the journey, Bay Lee and Magic walked right into the trailer without any resistance much to the amazement and delight of everyone watching. They are now flourishing in their new environment with the continued love and support of their human companion, Mary, who never gave up on these two sweet horses. Irene C. and her cat named Trouble live in New York state. Irene contacted me the first time because she wanted to know about several things in Trouble's life including how he had been severely injured. Trouble and I had a long chat. He told me how he loved being a cat. He loved the physical abilities of a cat body and how athletic he could be. Not to offend "dog people", he did tell me that dogs were pretty good too, but being a cat was special. Trouble also told me about his life prior to Irene. He didn't have a family and this was the one thing he really wanted in life. He was just thrilled to live with Irene and be a part of her life. Then Trouble told me about his accident. He was jumping a fence on his way home and landed on a pile of wood. The wood gave way and his leg was trapped. The only way out was to pull it free. This resulted in extensive injuries to his leg that required multiple surgeries. He apologized for all he had put Irene through. He said it was an odd accident and he didn't mean to get hurt. He asked that this not keep him from the outdoors because he loves his outdoor adventures. Irene said his description of the accident matched the veterinarian's supposition as to how it might have occurred, based upon the injury. Irene agreed to let Trouble still play outside as he requested but in a future session, we had a real heart to heart talk about coming home when he is called. That's Trouble..... always just in a bit of trouble! As our animal companions age, it is certainly normal for us to worry about what they are going through. Because they can’t verbalize their aches and pains, we tend to worry all the more. I am frequently asked to communicate with an aging animal. Most people want to know if they are in pain and what they can do to make the animal’s last years comfortable. In communicating with these animals, I am always amazed at how matter of fact they are about the aging process. You see, they view it as just part of the life cycle and don’t attach the social implications that we people tend to do. In one case, Candy G. from Colorado contacted me regarding her 15 year old dog, Oreo. It was obvious to Candy that Oreo was close to the end of her life and Candy wanted to know if Oreo was ready to pass away or needed help in moving on. Oreo’s message is one that I hear many times from animals in this situation. Oreo asked me to tell her family how much she would miss them when she passed on. She also said she would always watch over them. She wanted Candy to know that animals live on. Oreo also wanted Candy to know that she understood how sad her last days were for Candy. Oreo wanted to reassure Candy that she would go to a good place when she passed on. Finally, Oreo wanted Candy to know that if Candy had to help her pass on this was fine. Oreo knew that everything her family did for her they did out of love. "Yesterday marked the year’s anniversary of our putting down Oreo. Although we had both hers and her mother’s ashes, we could never agree on where to put them. A week or so ago, the issue was resolved. Both Oreo and her mother, Spring, had dug out a hole in front of the house. Oreo used to lie in the hole to sleep or observe the goings-on in the neighborhood. We thought about putting the dogs’ ashes in the hole, but at the same time, we thought either Ziggy or Cinny, our other dogs, might want to use it. What resolved the issue was that I found a wild rose bush growing in that hole. The ground in there was packed down pretty hard. It was amazing that the bush could come up through it. Last night, we put both Oreo’s and Spring’s ashes around the rose bush and then covered them with top soil." Karen K. from Georgia contacted me about her young horse, Shariq. Karen had been to the veterinarian regarding Shariq’s problem but before going forward with many additional medical tests which the veterinarian felt would reveal little, Karen thought Animal Connection might be able to help. Shariq was a beautiful Arabian colt at the time who Karen raised from a foal and expected great things from in the show arena. Unfortunately, Shariq spent a good portion of his day shaking his head, a habit which the vet felt could probably not be cured medically. Even though Karen would keep Shariq under any condition, she knew that with this habit, he would barely be able to be ridden and not have much of a life. Shariq explained why he kept shaking his head. He had the most annoying feeling just above his right eye that would come and go. His head shaking was his way to get rid of this feeling. He also explained that he knew there was actually nothing physical causing the problem but that didn’t make it any less annoying. Shariq and I communicated about his great heritage and about his noble breed. We discussed how difficult it might be to ignore this phantom problem but I was also convinced in the short time I met with Shariq that if any horse could overcome this issue, Shariq could. We discussed methods he might use to move past this. As in all my work, I am not in control of the animal’s behavior, however, I do try to find out what motivates them and I work toward correcting their behavior within that framework. In Shariq’s case, his love for Karen and his desire to please her was so strong that he was willing to try my suggestions. I heard back from Karen in about 24 hours. She was excited. Although the head shaking was not completely gone, she felt it had been reduced by about 75 percent! She now had some hope that Shariq would have a good life. So what happened to Shariq? Well take a look below. This colt went on to win the two year old colt class in his first show. He then went on to win Junior Champion Colt and was finally named Grand Champion Stallion. Written by Lanie M.of Tuscson, AZ. Lanie is Karro and Bobcat's person. 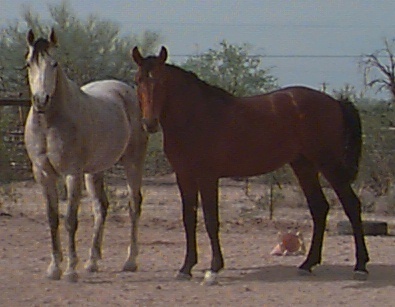 I would like to share a communication experience with my horses, Bobcat and Karro. Karro is my 7 year old Arab gelding and Bobcat is my husband's horse, who we rescued from the local livestock auction. Karro has always been a handful, but I have always felt that he was worth the effort and had a good heart. Although he has hurt me on several occasions, I always knew that is wasn't intentional. Karro was his usual self with Danielle. She asked him why he always seemed fearful of his saddle and he replied that he didn't like the smell! True to form, he told her that he would work on his acceptance of it, but he would make no promises. My other horse, Bobcat, was found at a livestock auction. For those of you who are not familiar with livestock auctions, most horses who are sold below current market value are destined for the slaughter yards. My husband and I were there to see how the animals were treated, as I had heard several horror stories across the country about harsh treatment, no water, no rest on long trips, etc. We were also there to see what the going price was, as current market for a rideable horse is around $1500. A few months later, I brought Bobcat home from my friend's boarding stable. Then I contacted Danielle to do another session for me. This time it would be for Bobcat to see where he was coming from. He had a very sad start to his story. He was separated from his family herd and transported to our livestock auction. Danielle described where Bobcat had resided before his potentially fatal trip. She also told me how Karro felt about Bobcat and how he sympathized with him, but essentially felt helpless to do anything about it. Danielle told Bobcat that he would be treated well and taken on trail rides, eventually, and also pointed out how Karro did things with us people to get rewards. Bobcat replied that he would try, but that he was still sad about the separation from his herd mates. We made all kinds of exceptions for Bobcat and let him take his time. When he was ready, he started to make headway in his training. Although he is still inherently distrustful of our actions, he is making outstanding progress. He has a halter on, he walks right up to us, he allows me to put a lead rope over his head and neck, and will let me scratch him back to his shoulder. This is incredible progress for a horse that used to cower in the farthest corner and hope that we would go away! Thank you Danielle for helping both my boys! Many animals tell me that they want to feel useful and have the need to have a "job" in their lives. Many tell me that they chose their life so they could be companions, teachers, communicators and even healers. As my 29 year old horse, Scarborough, was approaching retirement due to arthritis, I knew that it would still be important for him to have some responsibility along with retirement. I was very concerned about how he would adjust to his new role in life, since he still wanted to be active but couldn’t handle it physically. So what could Scarborough’s new job be? Well, he could still give pony rides, which he loved, but those were few and far between. Then it came to me. He could mentor my new horse. Explain the lay of the land, so to speak. Convey our "rules of the ranch". He thought this was a great idea after I explained how his age and maturity made him perfect for the job. Well, it didn’t take him long to really get into the new job. Duster, my new trail horse, had only been with us about a week when we had our first rain which turned our dusty stalls into mud. I went down to the barn to check on the horses and there Duster and Scarborough stood, caked in mud! Now, I wasn’t surprised at Scarborough, since this was usual for him. But I couldn’t believe what a mess Duster was! I spoke out loud to her telling her that I was under the impression that she was a fine lady who would never allow herself to become such a piggy! Well, was I ever surprised when Duster responded that Scarborough had told her that getting real muddy was what was expected at our ranch. He told her that when it rains, Danielle comes down to the barn and makes such a fuss over us if we are caked in mud! Yes, Scarborough was quite the jokester. To look at him you wouldn’t know it. But to know him like I do, you just have to love his sense of humor... well, at least most of the time! So the moral of the story is: Be sensitive to your older animal’s need to keep their dignity and feel useful. They are depending on you. AND be careful what you ask for. You just might get it! In the early autumn of 1997, I received a most unusual request for a communication session. Debra P., Vice President of the Humane Society of Loudoun County, Virginia contacted me regarding her concern over the vultures that migrate to Leesburg, Virginia each year. It seems that each winter this very large flock of birds returns to the same area and roosts in pine trees bordering many homes. The homeowners were upset over the mess the vultures make and it had finally gotten to the point where the U.S. Department of Agriculture has been called in to relocate the birds. Debra was extremely concerned about the harm that might come to the vultures during the relocation process and hoped that I could help convince the birds not to return to this area during the coming winter. I advised Debra of what I tell all my clients who ask me to make behavioral changes in their animals. I can only suggest to the animal that they change their behavior. I can certainly strongly point out the pros and the cons of a particular behavior; however, I have no direct control over an animal. Just like a human, the animal has to make the choice to change their behavior. With this in mind, Debra still decided to go ahead. I asked Debra to send me as many of the details as she could about the relocation. I wanted specific information on what would happen to the vultures if they returned to Leesburg. My strategy was to convince them of how dangerous it was to return and suggest they go somewhere else. Failing that, I wanted to tell them the details of what would happen, so they could be prepared for what they had to endure. My hope, and Debra’s, was that all the birds would remain safe, no matter what happened. Information now in hand, I began to think about how to actually contact them. I thought I would attempt to contact their leader and appeal to him to take the flock to a safer location. My biggest concern was how I would make the connection with his thoughts. We were over 3,000 miles away from each other and although this doesn’t pose a problem for me with domesticated animals, contacting a wild vulture whose specific location I did not know was a whole different story. I thought long and hard about this and planned my strategy. But my fears were quickly gone when I started the communication session. As soon as I tried to connect, their leader was there. He told me that his name is Crenshaw and his flock prefers to be called a tribe. Although he knew something about why I wanted to speak to him, he did not know the details. I then explained why the people did not want his tribe to live in Leesburg any longer. Crenshaw told me that his tribe was very upset and angry over the situation. They knew that something was about to be done by the people and he felt this was not right. The land was as much theirs as it was human land. He wanted to live in harmony. Crenshaw went on to tell me that the land belonged to his ancestors way before humans inhabited the area. He felt that the vultures were being very kind in letting humans share the land with them. Crenshaw also told me that others see the vultures as evil or are scared by their looks. He wished that people could see into their hearts since they are very kind beings who have chosen the vulture body as a way to learn. He also told me that to not return to this land would be a difficult decision. They knew they might be killed, yet this is part of their tradition and the essence of who they are. Crenshaw’s thoughts touched my heart. It was the first time I had heard a wild animal talk about animals and humans living together on the same land. But as much as I knew Crenshaw was right, the reality of the situation needed to press on. I tried to appeal to Crenshaw’s logical side as their leader and pointed out that many in his tribe might die, even if the humans were very careful in the move. I suggested that it would be easier for them to move. He then told me how his tribe has been handed down a legacy that they would be a tribe to endure much pain. So to his thinking, perhaps this was their time to face this event. My counter to this was that perhaps he should have the wisdom to see that there were better choices for his tribe, so they could survive longer and continue their work on the earth. After some additional discussion, Crenshaw closed by telling me that the elders would take my ideas under serious advisement. He wanted me to know that they appreciated those who care about them and are concerned for their well being. He wished there were more humans who cared this much for animals in this world. Crenshaw also wanted me to know that the people who care about animals are growing and that we are having an effect on others. He said to tell everyone who cares for animals that even when times look bad, we must not stop our animal work. We are making progress. So what happened to the Leesburg vultures in the winter of 1997? They returned to their roosting site a month later than usual and in smaller numbers than usual. Then in December, 50 of the vultures sat on the U.S. Department of Agriculture traps and collapsed them. About a month later, Debra emailed me to say that only 10 birds had been captured and released into a new area. I think the elder’s of Crenshaw’s tribe made a good decision. I truly thank Debra for giving me the opportunity to meet Crenshaw. His wisdom has changed my views forever. Please help me share Crenshaw’s message. Please help to continue caring for the animals.